Letter from a civil guard from the Julen rescue zone: "We will never stop until we return Julen to his parents"
"We have been working hard for more than a week, and why deny it, we find ourselves with a cut body but with an intact heart and a will that is left over". It is one of the phrases of the letter written in handwriting and sent to Diario Sur by one of the civil guards who has been working for the last 10 days to rescue Julen, the 2-year-old boy who fell into a well in Totalán (Málaga ). A letter with which the agent wanted to give testimony of the "human side of what is happening, because this is happening many limits . " The delegate of the Government in Andalusia, Alfonso Rodríguez Gómez de Celis, said it last night: the professionals who are working on these tasks do so "under a sufficiently hard pressure" , so he asked "not to add more", but "we all thought in giving them peace and tranquility and above all that they can be well concentrated ". Thus, the agent who wrote the letter relates how he "left his family with the plate on the table that fateful Sunday, the 13th" to go quickly to the place where the little Julen had fallen. "I will not forget the hot chill and the palpitations of my heart visualizing the camera screen on its way, try after try, because although my desire was to see Julen, I knew I would break to mourn if that happened , and on the other hand I was not even sure I wanted him to appear in those circumstances or to assess the possibility that he was not there and a new path of hope was opened, "he says. Because the rescue of Julen is being a titanic rescue, a work of unprecedented engineering in which hundreds of people are working tirelessly to rescue the child as soon as possible. "They were hard moments -qualifies the first hours of the device-, of excessive work and tension , still there was not even a relay, and during two days it was observed as some fireman and Guard slept in the cold vehicles so that the head could continue working "
The difficulty of the terrain, the adversities that have been found in practically every maneuver that has been made, the time that is going by ... but "Spain can be calm because its Firemen, personnel GREA of 112, Civil Protection, civilian personnel falcultativo, psychologists and, of course, your Civil Guard will never stop until you return Julen to his parents, that's for sure . " "We will achieve it" , concludes the emotional letter. A letter that aims to show what is not seen from a distance, what is not known about all the work and efforts that are being carried out to rescue Julen. Gómez de Celis was very clear last night to point out that the magnitude of work is "impressive" , since they have moved 40,000 tons of material, noting that "under any normal circumstances these tasks would take months and not only that, but with previous work related to the geology and disposition of the difficult terrain ". In addition, he said that the circumstance occurs that "it is a place where the veins are not uniform", which gives a "uniqueness" in terms of the hardness of the land. After the new difficulties that appeared on Tuesday when trying to make the jacket of the tunnel parallel to that is Julen, this morning and after a long night of hard work has been able to resume the jacket and accelerate the rescue tasks having already piped two thirds of the tunnel. 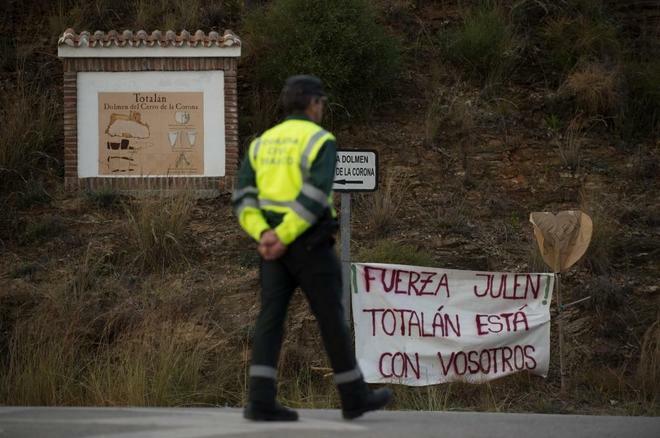 It would be necessary to drill the last 12 meters of the tunnel and as soon as the Mining Rescue Brigade is activated, they will have to go down and dig by hand the last four meters until they reach Julen.